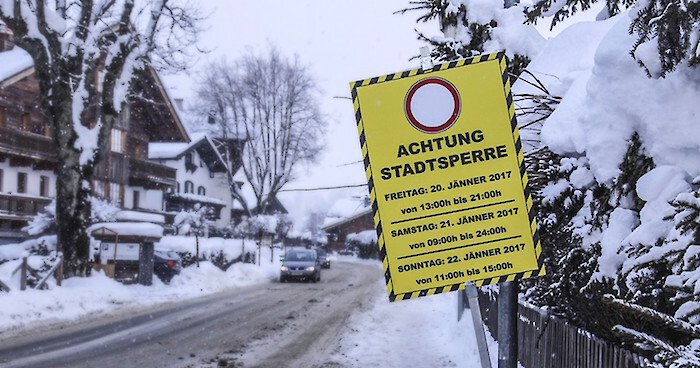 Access to the city centre is limited during Hahnenkamm-Raceweek. The following days and hours will be affected: Restricted access applies to the pedestrian zone from Monday, January 16th 2017 to Thursday, January 19th 2017 between the hours of 10 am and 6 am when only authorised cars are granted access. The city centre will be closed to all traffic from 6 am Friday, January 20th 2017 to 7 pm Sunday, January 22nd 2017. Deliveries to gastronomes in the city centre will be permitted entrance between the hours of 6 am and 8 am. Restricted access applies to the pedestrian zone from 7 pm Monday, January 22nd 2017 to 6 am Monday, January 23rd 2017 when only authorised cars are granted access. On Monday, January 23rd 2017 and Tuesday, January 24th 2017 the pedestrian zone will be closed off due to dismantling operations from 10 am to 6am. Thank you for your understanding. Please note: City buses will not be stopping at the city centre bus stop from Tuesday, January 17th 2017, up to and including Monday, January 23rd 2017. We would like to specifically point out that the area surrounding the city centre may only be accessed by delivery services and not by private vehicles from Monday, January 16th 2017 up to and including Monday, January 23rd 2017 between the hours of 6 am and 10 am.